Should I start my construction business out of the city? SHOULD MY CON-BUSINESS LOCATED OVER COUNTRYSIDE? Songkran festival is probably a family’s day for everyone. Many contractors just had time to go back to their hometown from work to spend quality time with parents and relatives before the holiday ends and going back to work in big cities. However, there are some people who do not want to go back in the big cities once they have arrived to their homeland, these people prefer to stay and grow up in their own hometown. This could be illustrated by the example of Khun Kae Kittichai Rikitpunya, he is one of the people who have been experiencing and learning new things in Bangkok. After living in Bangkok for awhile Khun Kae Kittichai Rikitpunya decided to go back to his hometown(Sra kaew) and started his own construction business called “ Ngam Dee Trading”. 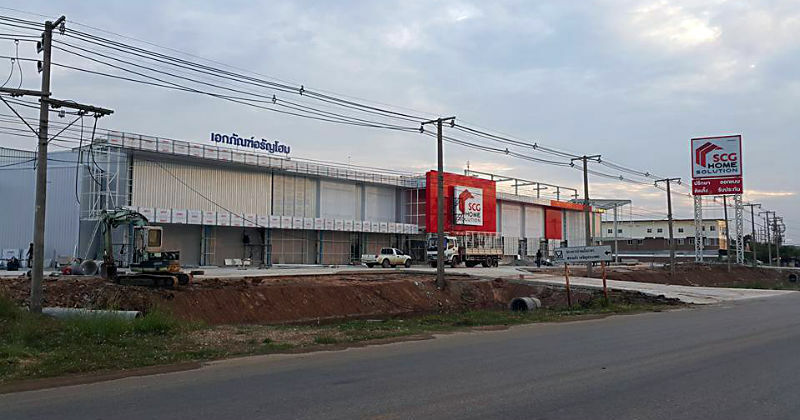 The business provides designing and consulting services as well as doing construction in Sra Kaew and Prachin Buri. In the view of general people, those who are educated and skilled should or must be living in big cities such as Bangkok. Nevertheless, Khun Kae, a member of our BUILK Pro Network has decided to live and operate his construction business in Aranyaprathet District Srakaew Province which is located in the faraway area from capital city. Therefore, BUILK team would like to interview him for the main reasons why he has made such a decision? BUILK: why don’t you operate your construction business in big cities or maybe Bangkok? Khun Kae: Do we see money as the most important thing? Or if you think money and progress are the two most important things in life then living in Bangkok is the right choice. If i was still living in Bangkok now, my business would has grown up quite a lot. However, i have this belief that money is not the main factor in life, but living happily in your own hometown is. My idea is that it does not matter how far progress or how much money you have made as long as you are not happy or enjoyable with the place you live then you are not living your life. I mean i could live in the big cities temporarily not permanently. BUILK: what is the main difference between working here and Bangkok? Khun Kae: Srakaew is a small city which we can do anything and reach anywhere easily. The community in Sra Kaew is small too, people know each other here which means you can quickly create connection and easily grow your network. At the same time, once you have done a mistake it can possibly cause a bigger problem than in Bangkok because the news will rapidly spread to the whole community, does it make sense? While in Bangkok no matter what mistakes you have done no one would know about it anyway. There are also some advantages and disadvantages of living in a small city. Furthermore, in the small city when the problems arise in our business, the faults will always come directly to the contractor, in fact when we are working on the project everyone is there to observe including the owner, contractor, engineer and other people. By the time we manage to know the cause of the problems, our reputation was already affected and can not be explained further to anyone else. BUILK: how do you protect your reputation? Khun Kae: there was one project which we had to dismantle and redo some of the works due to the inaccurate calculation at the beginning. The customer was someone we have never worked with before. However, due to the complains amongst the community, our existing customer who we have worked with before volunteered to protect our image by explaining to that client and telling them about our 10 years of excellent reputation and it worked the customer believed in us again. Currently, we have become 100% close with our customers and we refer them as our teams rather than clients. how to return to hometown with success ? BUILK: If there is a small subcontractor working in Bangkok and would like to return to their hometown do you have any advices or suggestions based on your own experience? Khun Kae: Oh they should, the earlier the better I suggest that they initially can come back home and work for a local company then they can start operating their own company step by step. If you come back home and immediately start building your own company you would hold quite a high risk, if anyone would like to come back to Sra Kaew we can have a chat, you are more than welcome and you can give a try. The most important thing to keep in mind is do not boast yourself that you come from a reputable and huge company from Bangkok for instances, RITTA company, Italian thai company. Moreover, do not show off yourself by telling people you have all the great skills and ask for high salary because it does not work here, when you are in Sra Kaew you have to understand and adapt yourself with environment and living standard here. If you really believe in your expertise and knowledge the jobs will definitely come to you without overselling yourself. One more thing, when you come back, you should come back proudly and happily and start your own journey here from small to big.